This reference book originates from the interdisciplinary research cooperation between academia and industry. In three distinct parts, latest results from basic research on stable enzymes are explained and brought into context with possible industrial applications. Downstream processing technology as well as biocatalytic and biotechnological production processes from global players display the enormous potential of biocatalysts. Application of "extreme" reaction conditions (i.e. unconventional, such as high temperature, pressure, and pH value) - biocatalysts are normally used within a well defined process window - leads to novel synthetic effects. Both novel enzyme systems and the synthetic routes in which they can be applied are made accessible to the reader. In addition, the complementary innovative process technology under unconventional conditions is highlighted by latest examples from biotech industry. 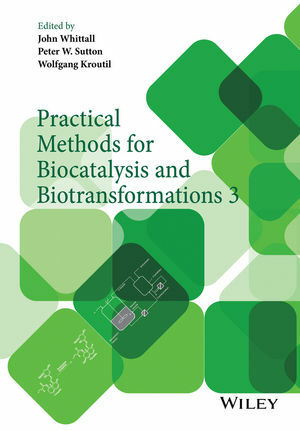 Dr John Whittall, Centre of Excellence for Biocatalysis, Biotransformations and Biocatalytic Manufacture (CoEBio3), Manchester Interdisciplinary Biocentre, University of Manchester, UK. Dr Peter W Sutton, Senior Scientist, GlaxoSmithKline Research and Development Limited, UK. Dr Wolfgang Kroutil, Department of Chemistry, Organic and Bioorganic Chemistry, University of Graz, Austria.